Lighting controls should be an integral part of the lighting design of each room. INTEGRATED DIMMING systems allow you to create multiple preset lighting scenes within a room. Scenes can be recalled with the touch of a button from a single wall box or with hand held wireless remote controls. 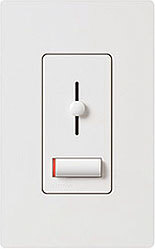 TOUCH DIMMERS allow you to vary the intensity of the lighting while depressing the button. These systems permit one-touch recall of the previous lighting level. Some are equipped with indicator lights that provide a continual readout of the lighting intensity. SLIDE DIMMERS provide full-range, manual dimming control. Some are equipped with a touch-button that allows you to return to the previous lighting level. Others have an indicator light that glows in the dark for easy location. SHADE CONTROL SYSTEMS create instant privacy and can prevent UV rays from damaging your furniture. Additionally, shade controls are a good way to save on HVAC in the summer and will help insulate your home in the winter, reducing heating bills. For more information on how dimmers will reduce energy consumption and save you money, watch this video from Lutron. For more information on energy efficient lighting, visit Wolfers Green Zone.